Barbados’ under-17 football team which recently qualified for the Caribbean Union of Teachers (CUT) competition is not only reaping success but also giving back to the community. Last Saturday the young men cleaned Hastings Rock Beach in Christ Church to demonstrate their appreciation for the environment and ensure that the surroundings were as clean as possible. Harewood added the team was actively training as they vied for a place in the CONCACAF grouping and inched closer to the ultimate dream of reaching the FIFA Under-17 World Cup scheduled for Chile next year. 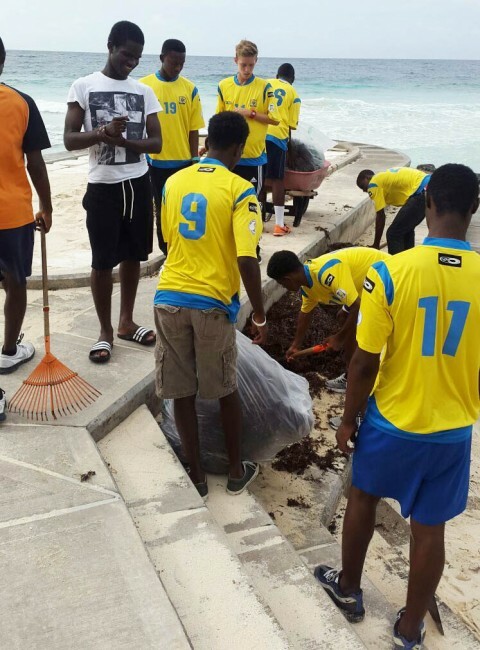 Barbados Under-17 footballers during their clean-up. This is awesome. More groups need to get together and do community service. Yea and citizens should not take advantage of this either, play your part and do not litter. just saying.